1929 – I arrived in the home of Emmet and Amy Russell and their son Philip, in New Hampshire on November 25—one month after the massive financial collapse leading to the Depression of the 1930s. My father, raised in the Midwest, and educated at Harvard— including a degree in Law, had felt called to become a pastor. There was a hurdle to overcome—his legal blindness since birth. But he had been encouraged to overlook obstacles, and pursue his calling. He married my mother, and together they spent three years in China where he taught sociology and law at a private university in Tienjing, before returning to the States to pastor churches in New England. My mother’s heritage had all the ruggedness of New England in it. Her mother had come over from London at 16 as an “indentured servant”, then married a Maine farmer. Her father came from sturdy stock—including the historic Mary Dyer, a Quaker, who was hanged on the gallows on Boston Commons in 1660, as a result of her Quakerism. Her statue still graces the State House in Boston. I entered school at the age of five—with all four grades in one room, meaning I could be promoted to third grade after my first year—a big mistake, for from that point on, it was only my intellectual development that kept pace. The rest of me—emotional and psychological lagged behind. 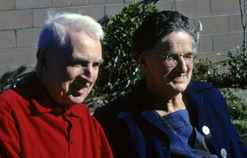 1937– From life in small villages in New Hampshire, we moved to Kansas City for a brief year—as my paternal grandparents died—and then to Wheaton, Illinois, for the next 13 years. Suburban life in Wheaton was a sea change sociologically. Wheaton was then just 8,000 inhabitants with the college looming large over all of its inhabitants. 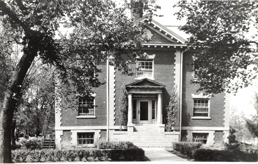 The college had an historic founder—abolitionist Jonathan Blanchard. His son and succeeding presidents maintained a strong adherence to conservative Christian principles. I was swept into the religious fervor and the stability of its influence; I appreciated the culture provided by music and cultural events staged there. While I actively entered into the college’s institutional program—1940 - Junior Academy, 1942 - Academy, 1946 - College and 1958 - Graduate School, I had to work to learn the subtleties of social life in that suburban environment. Suddenly I became conscious of how and where I fit, what the signals and cues were for relationship. My parents were less able to help because of their own history. What saved the day for me during my teenage years was an innovative program begun by college students for kids my age called Pioneer Girls. 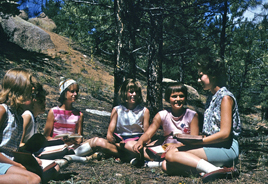 Although their club program was not appealing, their summer camp experience became a yearly highlight. I thrived—and found a “new self” hidden behind my shy uncertain exterior. The impact of this program was great on me and many others—and in 1996 resulted in this book, The Slender Thread, my paean of praise for this truly pioneering work to celebrate its 25th anniversary. Chicago — "City of the Big Shoulders"
1950 – My career post-college began with a position as Publications Manager of Pioneer Girls— my familiarity with the program being an instant asset, along with my degree in Christian Education. I enthusiastically moved into positions of increasing responsibility—Program Director, National Camp Director, Field Representative in the Rocky Mountains, Leadership Center Director, Cross-Cultural Program Trainer. I seemed to fit everywhere. I functioned reasonably well in the office, but surged with energy when out on the field meeting lay leadership, and especially in the summer camps where I could pull out all the stops and function freely and creatively. 1966 – Changes in top leadership proved problematic, and I left to begin PhD studies at the University of Chicago in Sociology. I was ripe for a change—not sure exactly what I needed. In 1967, I entered therapy—out of confusion as to why my life was not working on all cylinders. I have since called that brief experience in the winter of 1967 as “being born again.” It was more than a rebirth; I “grew up” into myself and in all areas of my life, including my sense of myself as a sexual woman, a Christian person, and a person whose purpose in life had a previously unrealized dimension. 1967-1969 - While the world was in flames over issues of race and the impending Vietnam war, I met and married Don Schatz, the Jewish artist and poet who opened his life to join mine. Neither of us was sure about the future; but there was trust that God was in our choice. 1970– I had learned to love Chicago—as much as my attachment to New England village life! So Don and I joined with others to collaborate in developing a concentrated Semester-in-Chicago urban immersion for students from Wheaton and other Christian colleges in the Midwest. It was a calculated risk, but we were pushed from students themselves, hungry to taste life in the city—less protective, less constrained. We set it up with idealism; this lasted two years. Then we had to start over again, and it was at this point that Don and I became the ones directing the program, and recruiting students. We earned some of our living from teaching together at Roosevelt University, and I was Conference Coordinator for Urban Research Corporation until that folded. I also trained as a Group Facilitator for Encounter Groups at Oasis Center for Human Potential. 1979 - A new chapter in our lives began when we moved from Chicago—a city of 3 million—to Boston, a city of 300,000 at the time. And we moved into Dorchester, a part of the city with a multiethnic character with a very different feel from our life in South Shore (98% black) and Hyde Park (with its University of Chicago subculture). I was focused with laser-like intensity on getting into my chosen field of life/work planning. I secured employment in two places: my day job was in Framingham working for the YWCA with CETA eligible women looking for help in getting work. One evening a week Don and I taught Career Assessment at Northeastern University in a new program just starting in their womens’ division. That evening job would provide for us for the next ten years as we launched our own project. 1981 – Then an opportunity opened up for Don and me to help Episcopal priest, Richard Faxon, salvage an abortive inner city ministry Richard had launched. We began working with its suddenly unemployed volunteers in a process that came to be known as Life/Work Direction. One day, the three of us walked up the hill to the State House to incorporate Life/Work Direction. We were “on our way” for a ride that continues to this day. 1990 – Don and I decided we wanted to live where we worked, and put out the word to our constituency. 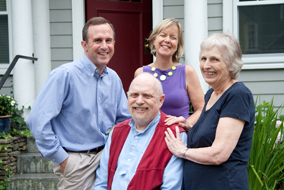 Scott and Louise Walker responded and offered us first floor space in the Jamaica Plain house they were buying. Life/Work Direction now had a home, and so did we. As the years passed, the urge to write my memoir came to fruition in Still Woman Moving: A Lifetime of Change—the title my husband suggested, to depict both the current of energy that made me a person thriving on change, but also a woman increasingly cherishing the stillness that invites a quiet wisdom. 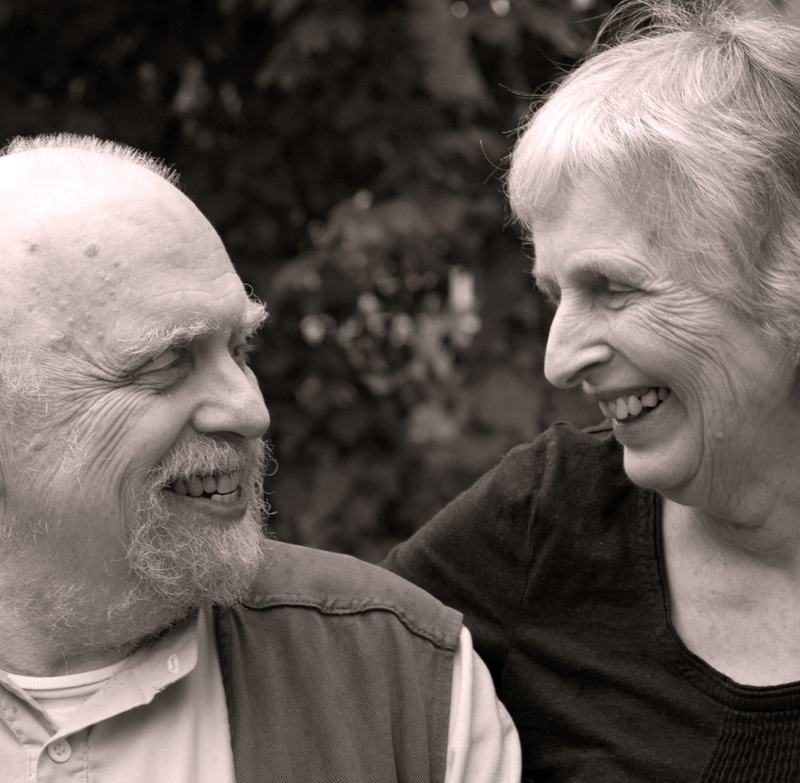 2005 – Since 1998, Scott and Louise Walker had been developing a program for younger persons patterned after our vocational process, in part, calling it Threshold. They were now ready to incorporate on their own, so we invited them to join Life/ Work Direction. Shortly thereafter, Don saw he could retire from his part in the work and devote himself to his writing of poetry. Again, it was time for another book—this time the story of Life/Work Direction’s inception and growth as I had experienced it with the Walkers. It was a work Intricately Woven by God. 2017 – It was time for Don and I to be more intentional about our stage in life, and for the Walkers to look toward their own future, so the board and staff gathered together for a weekend retreat to consider the past, present and future of Life/Work Direction, and identify a future direction that would affect us all. A steady transition process has been at work ever since. The Walkers are moving into greater clarity about their calling to the work. It means my having stepped back from front-line leadership in order to freely decide about my own future, separate from that of the work. Deciding to join Don on this website with my past writings beginning with this biography is an important part of that future. I invite you to peruse the writings included here, organized by topic: Marriage, Church and Religion, Inner Journey, Vocation, Women, Aging, Father, Money.